As you most likely have heard, Google has announced that they are “killing” Hangouts On Air. At least that’s what the news outlets and bloggers reported. That is simply not the case, and nothing is dying. The changes they are making (which will occur on September 12th) will basically move Hangouts On Air over to YouTube rather than Google+ – more or less a branding change, which makes sense as Hangouts always used YouTube’s live broadcasting system anyway. IMPORTANT – While we firmly believe that this will be a seamless transition for Webinars On Air users, Google has been known to roll out unannounced changes and updates without alerting developers prior to the release. We are strongly suggesting that our users take that into account, and if you have a webinar scheduled right now for September 12th simply postpone it a day or two. 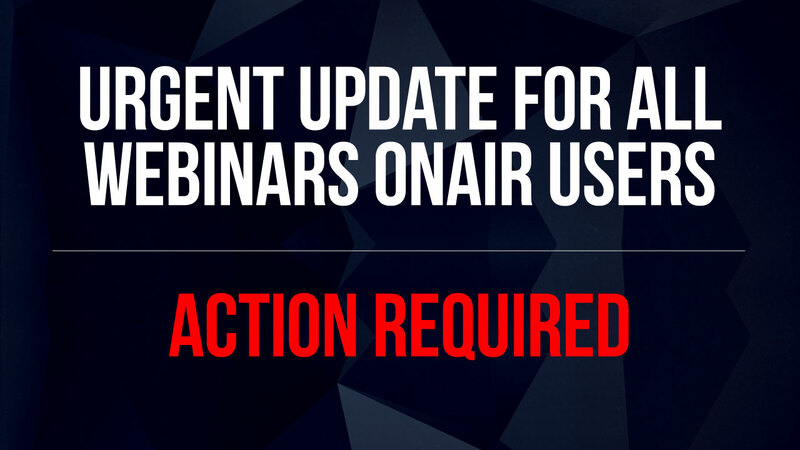 We would hate for this update to affect a scheduled webinar of yours. Google pushed out a new update that is affecting (and will continue to affect) many Hangouts On Air users and systems. They now REQUIRE you to have an AdSense account connected to your YouTube account in order to embed live streams. Webinars OnAir depends on this functionality to create your webinar room. Action Needed: You must now connect an AdSense account to your Youtube Channel to continue to use Webinars OnAir. We recommend you begin the process of setting up and connecting a google AdSense account to your YouTube channel immediatelyas it may take a few days to be approved. See the instructions below. We apologize for any inconvenience this may cause. We know these updates by Google affect numerous amounts of people, not just Webinars OnAir users, however, we strive to stay abreast of these updates to minimize the effect on our users. We’ll be in touch with updates as they are made available. Webinars OnAir has unlocked a new feature we like to call “stored offers.” You can now create and store your offers before you host your webinar, and pull them up at any time to show your attendees with just the click of a button! By popular demand, our users wanted a way to have multiple offers ready to go during their webinar without having to fill in the offer information while presenting live. We are constantly improving our software and we base every update we make on our customers wants and needs. Below is a quick walkthrough to show you what this looks like for our members, and how to take advantage of this new update! Enjoy! While we’re sure you’re probably getting a lot of emails in response to the recent OpenSSL vulnerability (CVE-2014-0160) nicknamed Heartbleed (http://heartbleed.com), we wanted to quickly update you on your Webinars OnAir account. The OpenSSL issue has affected a majority of services and sites across the web. Some of those sites include Google.com (and Gmail), Facebook.com, Pinterest.com, Yahoo.com, Youtube.com, and many more. Most of these were fixed within 24 hours of the security announcement. Within hours of the notice, we looked into whether or not your account with us may be vulnerable due to our use of OpenSSL. We found that our load balancers were using a vulnerable version of the OpenSSL package. And, along with the most trusted sites in the world, within 24 hours our load balancers were updated with a safe version of the OpenSSL package. When you have an e-commerce business, growing it online is possible with the use of a few different innovative options. Using webinars and webinar hangouts to build and expand your e-commerce business online is one way you can increase sales and build customer loyalty over time. There are various ways that webinars contribute to the success of online e-commerce businesses and websites today.